Prepaid forex travel cards are one of the best things to have in your wallet when travelling abroad. You get better exchange rates when loading foreign currencies in forex card than buying them as cash. This rate is fixed once funds are loaded into the card and does not fluctuate according to changes in the forex market. Also, you get to enjoy the benefits of both debit and credit cards. Use it to withdraw foreign currency from ATMs abroad or swipe it to pay for your shopping. Overall, forex cards are cheaper and more secure than carrying foreign currency as cash. In a previous post, we had compared the benefits and cons of forex card against cash, debit and credit card. In this post, to help you make an easy decision regarding forex cards, here we analyze the 8 best-prepaid forex cards in India for students and travellers in 2019. The Multi-Currency Forex Card offered by Axis Bank can hold 16 different foreign currencies in 1 single card. If you are planning to visit multiple countries for your holiday trip, this card will help you carry different foreign currencies together without needing to carry different forex cards. The card is offered in the VISA platform and offers TripAssist by Axis Bank – an emergency assistance in case of loss/theft of your forex card. You can also opt for a contactless Forex card powered by Visa’s payWave technology. Simply pay for your shopping by waving your card near PoS machines. This makes it secure against the information theft by skimmers who sometimes steal your card details when swiping at ATMs or PoS machines. The Card is valid for 5 years. You can reload and use it for multiple trips abroad in this period. First 3 ATM transaction charges waived off (free) for 1 year. *Inactivity period is defined as the absence of any debit/credit on the active/expired card for a consecutive time period of more than 36 months. **This fee is charged by an overseas merchant to convert transactions into your home country’s currency. It is also called DCC (Dynamic currency conversion). The World Traveller Forex Card is aimed at Indian travellers who undertake frequent international travel. It is offered by Axis Bank in association with Miles and More. Enjoy free membership to the Miles and More programme. Earn miles (which can be redeemed later) each time you load and spend currency through the forex card. The Card comes with Chip and PIN technology which is more secure than legacy cards using magnetic strips. Also, MasterCard’s contactless technology allows you to pay without needing to expose your card to information theft by skimmers. Thus transactions are fast and secure. You can redeem your miles online and offline with Miles & More and its partners. Partners range from Taj Hotels, Resorts and Palaces, Indiatimes Shopping, PVR Cinemas, and more. You can also redeem your miles for online Gift Cards. The Diners Card allows you to only load USD currency. Many extra benefits bundled with the card for travelers going to the USA. For every USD 5 or its equivalent amount in other currency spent using your card at merchant outlets, you can earn 2 points. These points can be redeemed against Diners benefits such as hotel/restaurant reservations and clubs. The Diners car comes along with chip and PIN technology which is an improvement in security over cards using magnetic strip. Additionally, you can also avail TripAssist feature of Axis Bank. Insurance coverage of up to Rs.1,50,000 in case of Lost/stolen/counterfeit cards and up to Rs 60,000 in case of medical treatment and ATM assault/robbery (FIR Required). Get up to 50% off on Visa Assistance Services at One Vasco, a company providing travel related services. The HDFC Multicurrency ForexPlus Cards lets you carry 22 different currencies in one single card. The card has Paywave NFC technology which enables customers to do contactless payments. Backup card facility in case your primary card gets lost or stolen. Emergency Cash Delivery Assistance – In case of loss of card or card failure, HDFC bank provides Emergency Cash delivery service across the globe through partnered banks. Specially made for students. The forex card acts as an International Student ID Card (ISIC) thus enabling you to a wide range of student discounts across 130 countries on books, travel, food and accommodation. You can use the ISIC card for all your study abroad related payments like books and tuition etc apart from withdrawing cash from ATMs. The card supports 3 currencies. The EMV chip in the card offers protection from skimming and misuse by third party people. Emergency Cash delivery assistance service across the globe in case of loss of the card. Complimentary Insurance cover of up to Rs 5 lakhs against fraud through forex card along with an accidental death coverage (air/ rail/ road) of Rs. 25 lakhs. Loss of baggage cover up to Rs 50,000 and loss of checked in baggage cover up to Rs 20,000. Passport reconstruction cover of up to Rs 20,000. The Regalia ForexPlus Card is loaded with USD currency. At the same time, it can be used for payments across other currencies. You don’t need to worry about the cross currency charges in such cases as it is ZERO for this forex card. ATM transactions across the Allpoint Network of ATMs are free. The Allpoint Network is available in 55,000 ATMs across 5 countries; USA, Canada, Mexico, UK, and Australia. HDFC Global Assistance in case of loss of card or card not working. Lounge access at International airports in India and complimentary concierge services across partnered hotels. Free Insurance coverage of up to Rs. 5 Lakhs in case of forex card fraud, Rs. 50,000 for loss of baggage and Rs. 20,000 for Passport reconstruction. The Borderless Prepaid Card by Thomas Cook supports 8 foreign currencies in a single card. The card has a validity of 5 years and the best part about the forex card is that you get a backup card absolutely free of cost. This backup card can be activated in case of theft or loss of your main forex card with the funds intact. Chip and PIN-based card protection. No charges for cash withdrawal at ATMs across the Allpoint network. Complimentary insurance cover up to USD 10,000. The One Currency Forex Card from Thomas Cook lets you load USD in it and use it anywhere in the world where cards are accepted. Since the card offers Zero Cross Currency Conversion, you’ll be able to use the USD loaded card in other countries without paying any additional fees. The card has a 5-year validity and is issued on the MasterCard network. The card comes with Chip and PIN technology just like in modern debit/credit cards making transactions secure and giving fraud protection. Now booking an Axis Bank, HDFC Bank and Thomas Cook Forex cards is easier than ever before. 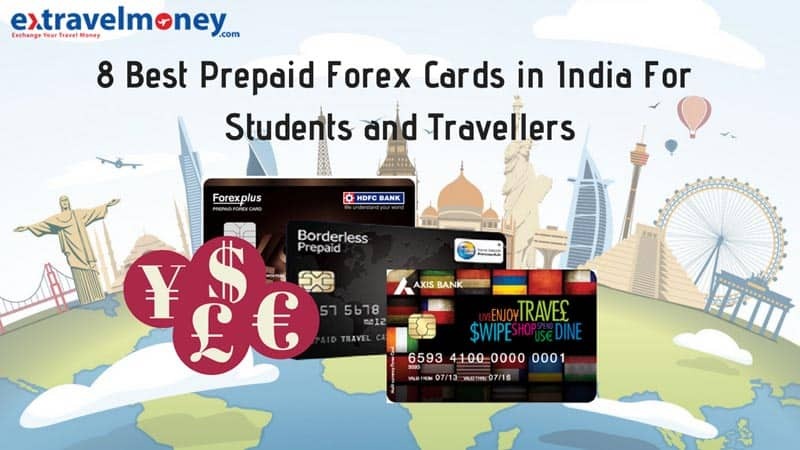 ExTravelMoney has tie-ups with more than 23 money changers across India who provide these forex cards at the click of a button. You can buy forex card in India online, get it door delivered and reload it whenever required. Got any doubts regarding forex cards? Mention in the comments below.